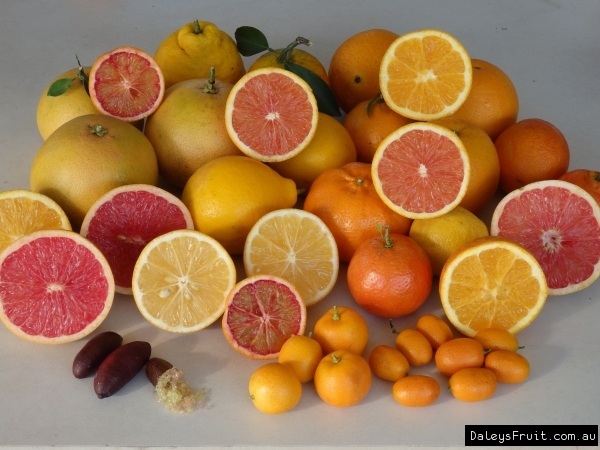 Citrus fruit trees are the most popular fruit bearing group of plants grown in Australia. The glossy green foliage, white scented flowers and colourful fruit make these trees just as suited to ornamental plantings and container growing as to the home orchard. The fruit is produced in abundance, is nutritious, versatile and can be left on the tree for long periods. Citrus grows best in an open and sunny position. Frost-free areas are preferable however most citrus will tolerate light frost once they are established. Correct planting and ongoing care as outlined in the catalogue is vital for long-term success. Selecting the varieties to grow is up to you, however we strongly recommend that your choice allows for the maximum spread of maturity times throughout the season.